The #1 New York Times bestseller from the author of Killers of the Flower Moon In 1925, the legendary British explorer Percy Fawcett ventured into the Amazon jungle, in search of a fabled civilization. He never returned. Over the years countless perished trying to find evidence of his party and the place he called "The Lost City of Z." In this masterpiece of narrative nonfiction, journalist David Grann interweaves the spellbinding stories of Fawcett's quest for "Z" and his own journey into the deadly jungle, as he unravels the greatest exploration mystery of the twentieth century. "Suspenseful. . . . Rollicking. . . . Reads with all the pace and excitement of a movie thriller. . . . The Lost City of Z is at once a biography, a detective story and a wonderfully vivid piece of travel writing that combines Bruce Chatwinesque powers of observation with a Waugh-like sense of the absurd. Mr. Grann treats us to a harrowing reconstruction of Fawcett's forays into the Amazonian jungle, as well as an evocative rendering of the vanished age of exploration." --Michiko Kakutani, The New York Times "Breathtaking. . . . Grann brings Fawcett's remarkable story to a beautifully written, perfectly paced fruition. . . . Any writer who can breathe life into letters written by scientists in the early 1900s deserves more than a hat tip." --The Los Angeles Times "Brilliant. . . . Impressively researched and skillfully crafted. . . . Grann makes abundantly clear in this fascinating, epic story of exploration and obsession, [that] the lethal attraction of the Amazon mystery remains strong." --The Boston Globe "A smart biographical page-turner." --USA Today "Grann escapes death and tracks down Z, giving the reader the kind of Indiana Jones kicks best experienced vicariously." --Details "A riveting, exciting and thoroughly compelling tale of adventure." --John Grisham "Thoroughly researched, vividly told. . . . Grann recounts Fawcett's expeditions with all the pace of a white-knuckle adventure story. . . . A thrill ride from start to finish." --The Washington Post "The story of Z goes to the heart of the central questions of our age. In the battle between man and a hostile environment, who wins? A fascinating and brilliant book." --Malcolm Gladwell "A spellbinding tale that produces fresh surprises around each turn. . . . An amazing story." --Dallas Morning News "A fascinating yarn that touches on science, history, and some truly obsessive personalities." --Entertainment Weekly "There is something about Fawcett's spirit and self-assurance that captivates. . . . To read The Lost City of Z is to feel grateful that Grann himself bothered to set out for the Amazon in search of the bones of an explorer whose body was long ago reclaimed by the jungle." --Christian Science Monitor "In a hyperconnected and exhaustively charted world, here is a revelation about wildness and the mad desire to plunge into it. . . . Unfathomably riveting. . . . Grann wildly delivers the goods." --GQ "A blockbuster tale of adventure." --New York Observer "Marvelous. . . . [Grann] combines a colorful narrative of Fawcett's early life, military career, jungle treks, theories and even conversations with a biography of an extraordinary man and an overview of the last great and highly competitive age of exploration." --Bloomberg News "A blood-stirring reading experience." --The Denver Post "A deeply satisfying revelation. . . . What could be better--obsession, mystery, deadly insects, shrunken heads, suppurating wounds, hostile tribesmen--all for us to savor in our homes, safely before the fire." --Erik Larson "What makes Mr. Grann's telling of the story so captivating is that he decides not simply to go off in search of yet more relics of our absent hero--but to go off himself in search of the city that Fawcett was looking for so heroically when he suddenly went AWOL." --Simon Winchester, The Wall Street Journal "Fast-paced adventure. . . . Grann delights us with the lure of obsession under a canopy of trees." --Cleveland Plain Dealer "Absorbing and fair-minded. . . . In restoring a life that history has swallowed from general view, and vindicating a crackpot theory, Mr. Grann has also exposed the toll that explorers often took on those who loved or depended on them." --Richard B. Woodward, The New York Times "An engrossing book, whose protagonist could outmarch Lara Croft and out-think Indiana Jones. . . . It's almost enough to make you reach for a backpack." --The Daily Telegraph (London) "A riveting adventure-mystery in the tradition of Conan Doyle's The Lost World, said to be inspired by Fawcett." --The Toronto Star "Perfect for armchair travelers and readers with fond childhood memories of books recounting tales of adventure in the dark wild. . . . What [Grann] found should help change how we think about the Amazon. . . . Read it, shiver with delight and thank your lucky stars you're never going to get as close to a candirú as Fawcett and Grann did. (Look it up on Wikipedia, if you dare.)" --Richmond Times-Dispatch "Thrilling. . . . What a story. . . . The beauty is that as incredible as it is, it's true." --Daily News "Outstanding. . . . A powerful narrative, stiff lipped and Victorian at the center, trippy at the edges, as if one of those stern men of Conrad had found himself trapped in a novel by García Márquez." --Rich Cohen, The New York Times Book Review "Did Grann find the lost city? . . . It's worth reading every page of this marvelous book to find out." --Houston Chronicle "Grann is no hard-as-nails explorer, and his self-deprecating personal narrative . . . serves as a comic counterpoint to the superhuman exploits of Fawcett. Grann may not be able to hack the wilderness very well, but as a storyteller he's first-rate." --Outside "Grann has an extraordinary sense of pacing, and his scenes of forest adventure are dispatched in passages of swift, arresting simplicity. . . . A splendid, suspenseful book." --Bookforum "With this riveting work, David Grann emerges on our national landscape as a major new talent. His superb writing style, his skills as a reporter, his masterful use of historical and scientific documents, and his stunning storytelling ability are on full display here, producing an endlessly absorbing tale about a magical subject that captivates from start to finish. This is a terrific book." --Doris Kearns Goodwin "A thrilling yarn. . . . What [Grann] finds is what makes The Lost City of Z so gratifying, and in the end he, and we along with him, find ourselves stunned by what Percy Fawcett discovered." --The Oregonian "Grann paints a vivid picture of the final days of trail-blazing, Earth-bound grand exploration, before airplanes and radios began stripping the mystery from the unknown parts of the world." --The Virginian-Pilot (Norfolk, VA) "Meticulously researched and spellbinding. . . . Reads like a cross between an Indiana Jones adventure and a Gabriel Garcia Marquez novel. . . . Gripping." --The Ottawa Citizen "Irresistible. . . . At once a biography of Fawcett, a history of the era of exploration, a science book on the nature and ethnography of the Amazon and a thrilling armchair adventure. . . . [It] has everything to fire the imagination: Romance, nostalgia, bravery, monomania, hardship, adventure, science, tragedy, mystery." 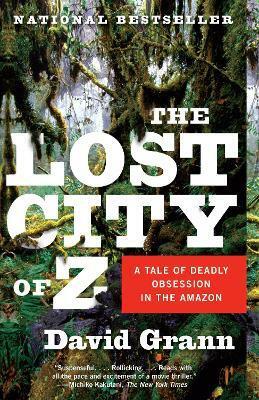 --South Florida Sun Sentinel "The Lost City of Z is meticulously researched, riveting and horrifying, guided by a core mystery that seems unimaginable and an author driven into the depths of the jungle by his daring to imagine it." --Philadelphia City Paper "Absorbing. . . . A wonderful story of a lost age of heroic exploration." --The Sunday Times (London) "Tantalizing. . . . Grann gives us a glimpse of the vanished age of exploration [as well as] a suspenseful, often very funny account of his own trek as a complete amateur into the 'green hell' of the Amazon. . . . Immensely entertaining." --The Gazette (Montreal) "Thankfully, for those of us who secretly live and breath for the swashbuckling adventure tale, every now and then a book comes along that renews our faith in the epic quest narrative, its ability to inform and enlighten even as it feeds our most primal need for dramatic amusement. [The Lost City of Z] succeeds tremendously in these pursuits." DAVID GRANN is a longtime staff writer at The New Yorker. He has written about everything from New York City's antiquated water tunnels to the Aryan Brotherhood prison gang, from the hunt for the giant squid to the mysterious death of the world's greatest Sherlock Holmes expert. His stories have appeared in several Best American writing anthologies, and he has written for The New York Times Magazine, The Atlantic, The Washington Post, The Wall Street Journal, and The New Republic.